What you need is probably here. Despite the threat of appreciable snowfall this weekend, it's technically spring and time for the Mt. 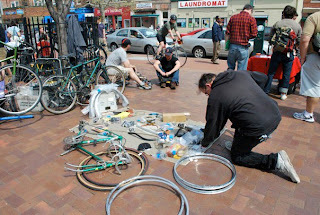 Pleasant Farmers Market DC Bike Swap 2011 Saturday, March 26 from Noon - 2:00 pm at Lamont Plaza. The Mt. Pleasant Farmers Market is a coalition of farmers, bakers and probably a few candlestick makers who sell fresh local fruit and vegetables, flowers, herbs, eggs, meat, dairy products, fresh bread, sweets, and other baked goods. They also offer a bike clinic program that teaches basic bike maintenance and occasionally has bike swaps, which gives local bicyclist the opportunity to purchase new, slightly used or mostly used bike equipment. It also provides an opportunity to talk with fellow bicyclists and will probably include the chance to talk with the WABA D.C. bike ambassador Daniel Hoagland and see his remarkably large bike trailer. Last year, BAC representative Meridith Begin sold a quality rear cassette to BAC representative Randall Myers, thus completing the circle of bike part life. This year's clinic in Mt. Pleasant will be in the same location as last year's event, Lamont Plaza, 3200 Mount Pleasant Street, NW between 17th, Mt. Pleasant and Lamont Streets NW across from Hellers Bakery. If you are interested in selling items, post your request on the Farmers Market facebook page.